Mother's Day will be here before we know it and we all know your Mom is great! Why not tell the world and win some prizes (maybe even money!!) at the same time??! 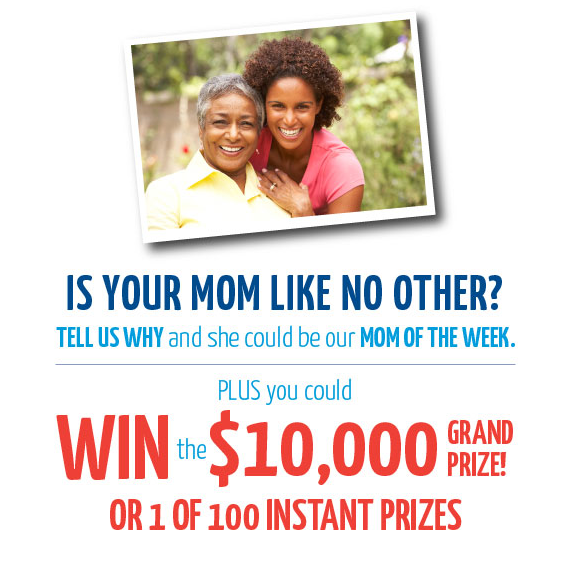 Scotties Facial Tissue, a leading tissue manufacturer agrees that your mom is “Like No Other” and has even created a Facebook contest so that you can tell us why – and possibly win $10,000! Enter the contest at www.Facebook.com/ScottiesLikeNoOther and then simply tell us why your mom is unique. You can submit a story (and even a photo if you’d like) about your mom and what makes her one of a kind. Visit the site each day for more chances to win the grand prize or instant-win prizes! Don’t worry though you only have to enter your story one time. There is a $10,000 grand prize as well as 10 weekly prizes (worth $500) and also 100 instant prizes! The grand prize winner will be announced on Mother’s Day – Sunday, May 11th. Such great reasons to give it a try! So spread the word about your great MOM and enter to win great prizes at the same time...sounds like a great contest to me!